The Cemetery opened in 1902 yet there are no WW1 CWGC graves. Two ex-soldiers who died in 1920 are buried in the Cemetery but neither has been recognised by the CWGC despite the inscription on John Smith's grave indicating his death was due to wounds received in France. 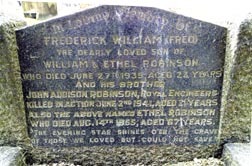 There is also a grave for an ex-soldier who died after the CWGC cut off 31 August 1921. The Cemetery was the original home of the Dearne Memorials Group now Barnsley Cemeteries who have indexed all the cemeteries and cremations in the area up until almost the present day. Searches of their database are free and results are a very reasonable £3.50 for 50 credits. John is buried at Gonnehem British Cemetery in France and commemorated on the Commonwealth War Graves Commission website. Only Ada and her husband John are buried in this grave, the other sons mentioned are not buried here. Some great detective work is going on across Barnsley and the wider digital community of the Barnsley War Memorials Project. Publicising that we have a problem to solve seems to be attracting help from all over the country. Our aim is to create a Roll of Honour commemorating Barnsley's fallen service personnel, including nurses, volunteers and the civilian casualties of World War One. You can read more about our project here. Once we had copied the names from our 600+ memorials into a huge spreadsheet we began to add service details using the Commonwealth War Graves Commission website, Soldiers Died in the Great War on Ancestry and the local newspapers as sources. Two years on and in a spreadsheet of nearly 4,000 names we still have over 300 names taken from the memorials yet to be identified. We have published a list on our website, just click on the 'Unidentified Men' tab above. As these men are gradually identified we are gaining a better understanding of the limitations of relying on the evidence on the war memorials. The spellings of the names, the initials and the service details (where supplied) are only as good as the information supplied by the families to the various committees and only as good as the stone mason or artist's interpretation of that information. Sometimes it is our interpretation of the memorials that is at fault and a second pair of eyes is all that is need to spot the error and identify a man. One of recent identifications was of L Hoyle on the war memorial in St Mary's Church in the centre of Barnsley. 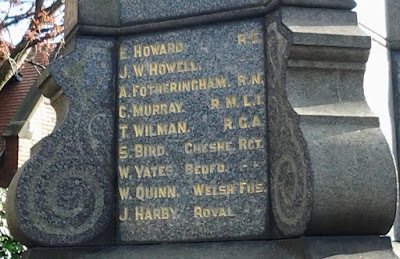 Panel 2 on the memorial has a red title after the first two names, who are carried forward from the previous panel. It reads, "Yorks and Lancaster Rgt, The Barnsley Battalions" and there is a long list of names underneath. These are the men who served and died in the 13th and 14th Battalions of the York and Lancaster Regiment, also known as the Barnsley Pals. Right down at the bottom are Pte L Hoyle and L Corpl W Whysall. We assumed they were in the Pals too, maybe added a little later as they were out of alphabetical and rank sequence. However we now know that Lawrence Hoyle was in the West Yorkshire Regiment and Walter Whysall was in the Yorkshire Regiment. Note that little line just above their names! It's a big clue that these names WERE added later and out of order. 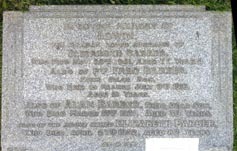 Thanks to MAC from the Rotherham War Memorials site, who has also researched the Second World War memorials for Barnsley, for identifying Lawrence Hoyle for us. Within the last few days a name on the Grimethorpe War Memorial has been identified by a reader of our Facebook page, Rita Rogers. 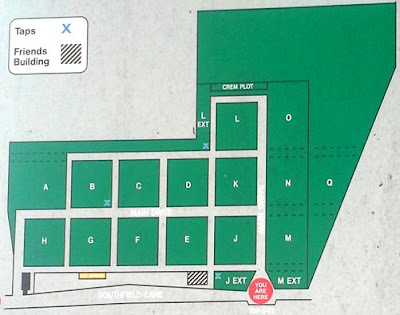 She spotted that the double dash after J W Howell's name, shown in the picture above, might not a ditto mark as we had assumed, stating that J W Howell had been in the Royal Engineers, but rather an indication that his regiment was unknown. This encouraged her to investigate other possibilities. 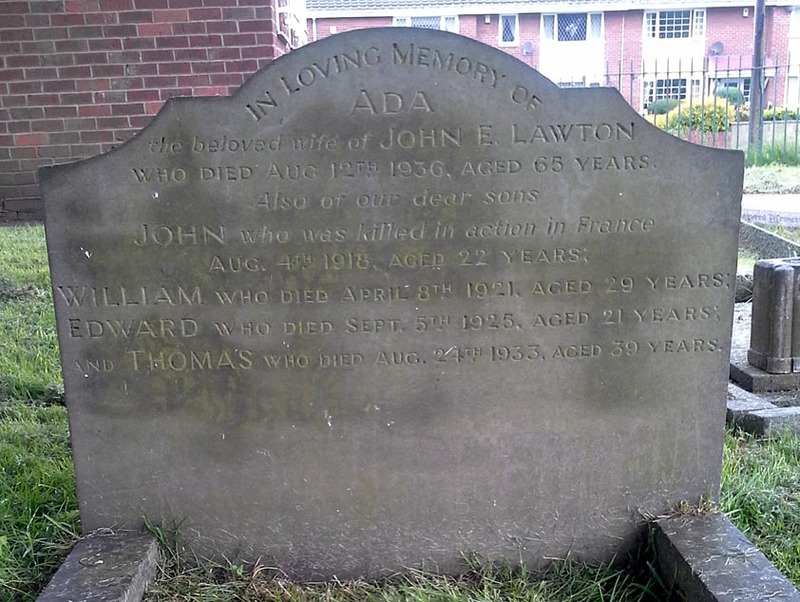 With a bit of research utilising her family history experience Rita discovered a family by the name of Howell in Cudworth from which two sons emigrated to Canada in 1914. John William Howell joined the Canadian Engineers in July 1915, which may be where the confusion occurred. His Canadian service records clearly show he was born in Barnsley. Great work Rita! A recent appeal in the Barnsley Chronicle, our local newspaper, has resulted in several new volunteers, including Andy Lusha, an ex-soldier, who has been coming into Barnsley Archives at Barnsley Town Hall on Thursday mornings to work with us. There is free access to Ancestry in the Archives as there is in local libraries around Barnsley, plus the digitised Barnsley Chronicle and other local newspapers on microfilm. There is also the cuttings index to the Barnsley Chronicle, August 1914 to March 1917, to which has now been added our own Barnsley War Memorials Project index to servicemen and women named in the Chronicle from April 1917 to March 1919 completing coverage of the war years. 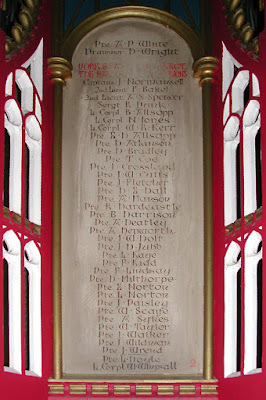 Last week Andy confirmed the identity of his first 'Stray' (that's the nickname we give to our unidentified men), a man named only as A Blacker on the Cortonwood Colliery war memorial, by cross checking Ancestry's Soldiers Died in the Great War database against the cuttings index. He found the above piece from the Barnsley Chronicle dated 24 June 1916 which confirmed that Arthur D Blacker lived at Stairfoot, but had worked before the war at Cortonwood Colliery. His full name was Arthur Dames Blacker and he served in the 14th Battalion of the York and Lancaster Regiment, the 2nd Barnsley Pals. Well done Andy! 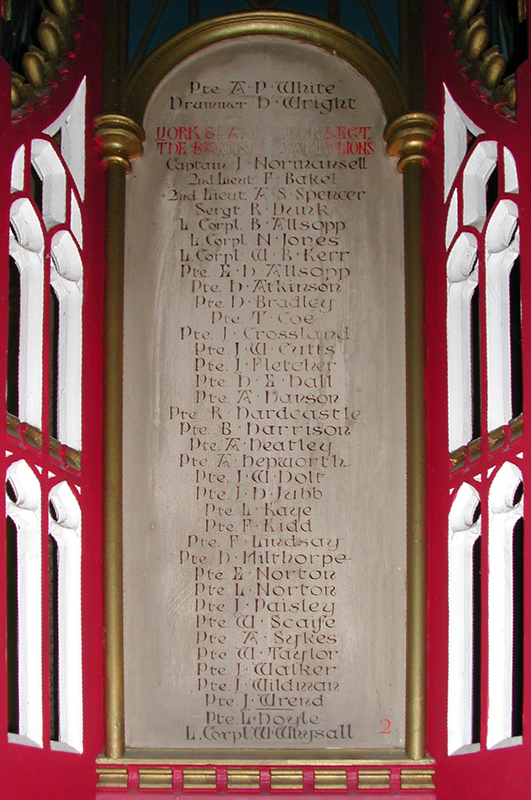 A D Blacker is also named on the war memorial at Ardsley Christchurch. Another volunteer to come forward following the Chronicle piece is Stu from Birmingham who has offered to use some of his spare time looking up Barnsley men in his CD copy of Soldiers Died in the Great War. Thank you Stu! Many hands make light work - or so the saying goes. If more people could help us with our unidentified men, especially people with local knowledge or access to Ancestry either in their own homes or in their local libraries or Archives, I am sure we would soon find many more of our missing men. If you would like to help why not contact us on bwmp2015@gmail.com or visit our Facebook page.